BladeTape is a fantastic, almost revolutionary hockey product. Customers who try it love it. 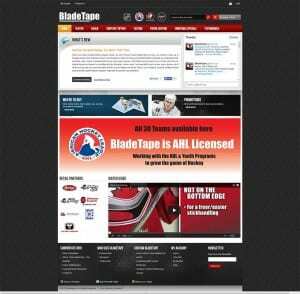 PlatinaIT has provided complete design and development support of a Magento based website for BladeTape for hockey. PlatinaIT is a leading Magento web design service provider for small business as well as large multinational corporations. We are a one-stop solution for all your IT needs. Call (416) 273-7206 to discuss your IT needs today. We contacted Platina IT Technologies based on strong references from colleagues. We were seeking help to design and develop an interactive website as part of our BladeTape project. From the beginning, our experience with Platina was nothing short of excellent. Platina Magento designers, aggressively engaged us in developing a Player Shop and Goalie Shop for our website and brought our vision to end in a timely manner. Further, their continued customer-support in service of the website is brilliant. We highly recommend PlatinaIT to anyone seeking development of a professional, exclusive, and visually attractive Magento website.